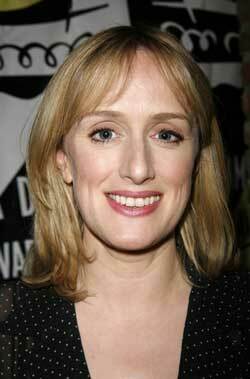 Jenna Russell began her career with the RSC playing Fantine in Les Miserables. After appearing in three shows at The Bridewell theatre (On A Clear Day, Hello Again and The Cutting Edge), she left the cast of Songs For a New World during rehearsal in order to play Deborah Gilder in the hugely popular ITV series Born and Bred. From 1990 to 1992 she played Maggie Lomax in BBC’s On the Up. She also sang the theme song to Red Dwarf. In 2005 she appeared as the Floor Manager in the Doctor Who episodes "Bad Wolf" and "The Parting of the Ways" and also played the lead role of Sarah Brown in Guys and Dolls opposite Ewan McGregor and Nigel Harman. In 2006, she took over from Anna-Jane Casey as Dot in the London revival of Sunday in the Park with George, by Stephen Sondheim for which she received an Olivier Award. She subsequently played Amy with Felicity Kendal in the play Amy's View. In 2008 Jenna made her Broadway debut in the transfer of Sunday in the Park with George and won a Theatre World Award, was nominated for a Drama Desk Award as Outstanding Actress in a Musical as well as a Tony Award for Best Actress in a Musical for her performance . In 2009 she appeared as Petra in the resurrected TV series of "Minder" starring Shane Richie. Jenna has most recently been playing the Baker's Wife in the Sondheim/Lapine Musical Into the Woods at the Open Air Theatre Regent's Park . She starred in Victoria Wood's new musical That Day We Sang at the Manchester Opera House and recently appeared in Sondheim's Merrily We Roll Along at the Harold Pinter Theatre and Urinetown at the St James'.